Entry is only open to Registered Cardholders who are Qantas Frequent Flyer members who have chosen to convert their Woolworths Dollars rewards into Qantas Points. Temporary Cardholders are not eligible to enter. Entrants must be 18 years of age and over and residents of Australia. draws - Engage Australia Pty Ltd - are ineligible to enter. Employees of the Promoter directly involved in the Promotion (and their immediate families) are also ineligible to enter. a. 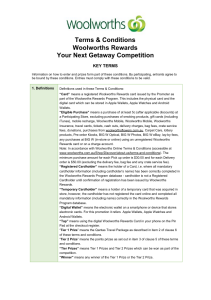 Choose to convert their Woolworths Dollars into Qantas Points at www.woolworthsrewards.com.au during the Promotional Period, or chosen to convert their Woolworths Dollars into Qantas Points prior to the Promotional Period and remain with this option for each entry during the Promotional Period. b. Make an Eligible Purchase and scan or Tap their Card in-store at the checkout at any Participating Store, or add their Card membership number to their account when shopping online atwww.woolworths.com.au, www.bws.com.au or www.bigw.com.au, in each case prior to the completion of the Eligible Purchase. The member’s First Name and Last Name on the Card must match the member’s First Name and Last Name in their Qantas Frequent Flyer account, (together an ‘Eligible Entry’).